This is a comprehensive agreement to record the joint ownership of a single property. Each owner lives in the property, but with living accommodation divided so that the only commonly shared area is the main exterior entrance. This document provides set of rules to regulate management and use of the property. It is suitable to use where the owners agree to share the property in one set of ratios and contribute towards costs and expenses in another set of percentages. The agreement includes paragraphs covering eventual sale, agreed uses of the property, and obligations of the owners. This agreement covers any situation where two or more people (or sets of people) share ownership and use of residential property for permanent occupation. It sets out how the property is owned, how maintenance is paid for and carried out, and how the owners may sell their share. 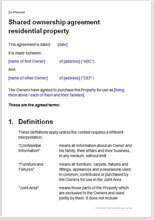 This agreement is suitable not only for situations where, for example, each owner has the exclusive right to use a bedroom and shares the use of all other rooms, but also for virtual flats where, for example, each owner has the exclusive right to use a bedroom, living room, kitchen and bathroom and the only shared area is the entrance hall. Under the South African law, the registration of ownership does not record the shares in which the property is held. So if you own 60% and I own 40% we have to record that in some other document such as this one. If we do not do so, the law will assume we own it in the same proportions in which we contributed to the purchase price, which may not be the same as we agree. This agreement specifically records the ownership proportions, which could be calculated at any time by a formula that takes into account differing contributions to an initial deposit, mortgage repayments and payment of repairs and improvements. It can also record a beneficial interest – the share owned by someone who is not a registered owner on the title deeds. Most commonly, this may be a family member of one of the owners who has lent money as a deposit. Note that this document does not cover how the owners will live together. It deals with ownership issues only. For living arrangements, you should use a cohabitation agreement such as this one. You may wish to consider what the most suitable structure for your sharing proposal is. If there are more than four owners, then it is likely to be better to hold the property in a limited company and buy and sell shares in it. Ownership of the property itself (by the company) would never change and so no stamp duty is paid on transfers once it is bought. However, your mortgage provider may not lend as much to a new company as to individuals. Running a company also does cost money, so with fewer owners it is a matter of preference as to whether you want the formality, expense and greater certainty of a company structure and a shareholders agreement, or the lower cost and comparative informality of an agreement like this one.